Here's a look back at some of the celebrities and notable personalities who graced the park with their presence in 2013. At the Word for Word Series, we welcomed Philippe Petit, Dan Savage, Raúl Esparza, Wendy Williams, Dwight “Doc” Gooden, Colum McCann, Chuck Klosterman, Lauren Weisberger, Hoda Kotb, Meredith Whitney, Sheila Blair, Aisha Tyler, Ben Mezrich, John Fugelsang, Amir Oz, and Amber Tamblyn. Masters of the Piano in Bryant Park keyboard included Junior Mance, Terry Waldo, Todd Robbins, and Daryl Sherman. Breakfast Briefings at Southwest Porch featured informal talks with Toni Collette, Bobby Flay, and Sebastian Junger. 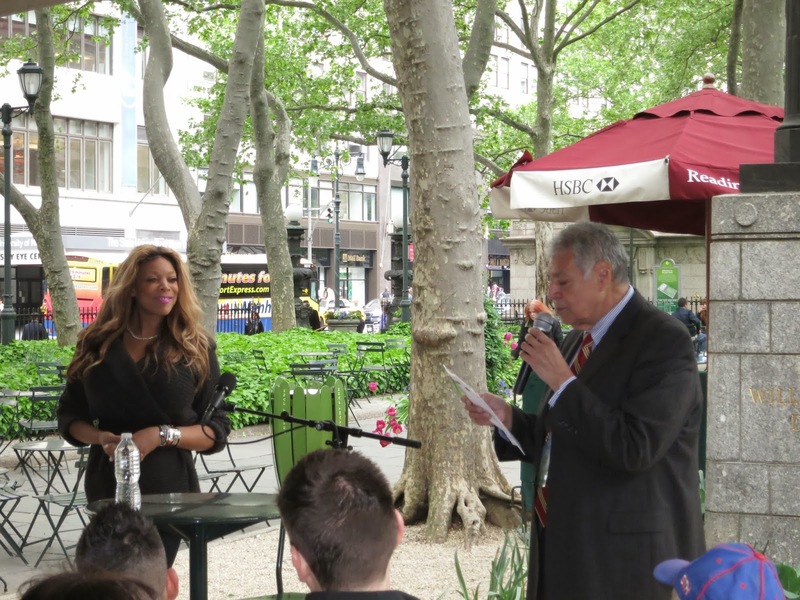 Naomi Campbell and Nigel Baker appeared at Bryant Park for a The Face television shoot. Alyssa Milano and the Project Runway designers came to the park to shoot a segment. Every All-Star from the National and American Leagues gathered at Bryant Park Grill before climbing onto vehicles that carried them down 42nd Street for the All-Star Parade. Mets pitching sensation Matt Harvey did a comedy ‘bit’ for Late Night with Jimmy Fallon at the park. We also spotted former Mets and Yankees player Daryl Strawberry enjoying the park on a nice day. To wind up the MLB theme, former Mets closer John Franco handed out Good Humor ice cream bars at the HBO Bryant Park Summer Film Festival. Tony Award winning actor Billy Crudup, currently performing in Waiting for Godot, was interviewed at the Bryant Park Grill on November 24. Actress Jamie Chung was spotted at The Rink around Thanksgiving Day. Five for Fighting performed at Southwest Porch. Shakira performed for T-Mobile, turning the park pink. Shakira performed at Bryant Park for a T-Mobile promotional event. The show was opened by Swizz Beatz. Big Bad Voodoo Daddy headlined The Tree Lighting Show at Bank of America Winter Village. Carly Rose Sonenclar also sang, Olympic Gold Medal winner Sarah Hughes and three-time U.S. Men’s Champion Johnny Weir performed on the ice, and Yankee legend Mariano Rivera led the countdown.